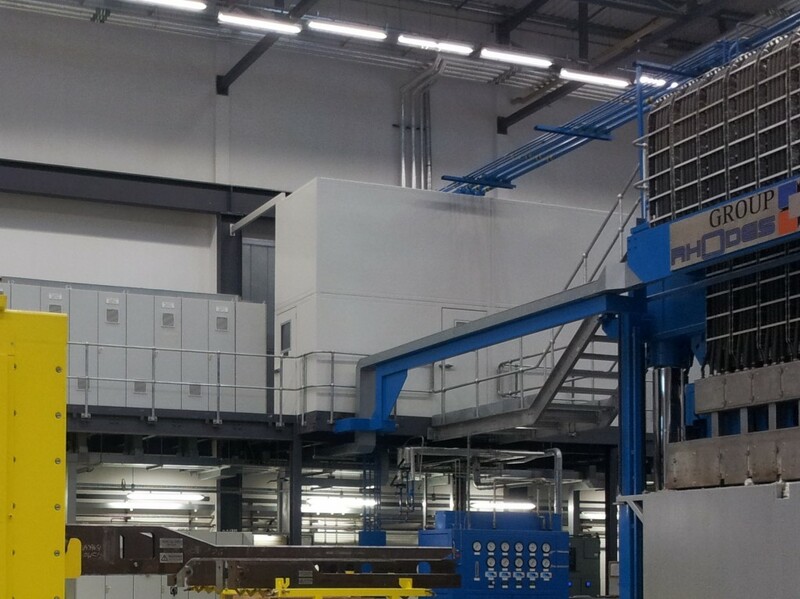 Walk-Through Acoustic Screen to a ‘Hydraulic Power Pack’ serving a ‘Titanium Hot-Form Press’ used in the manufacturing of military aircraft parts for a major UK Aerospace & Defence supplier. To design, manufacture, deliver, install and commission two acoustic screens, each of approximate overall sizes 5.6m wide x 4.0m high, with 1.8m long 'return' end walls, a partial roof (to the front edge) and acoustically absorptive panels 7.5m long x 4.0m high to existing rear factory wall. The screens & rear wall linings are to be fit for purpose in providing a safe working environment for operational and maintenance personnel at platform & floor level, in reducing both direct & reverberant noise from the hydraulic power packs mounted at platform level, in a highly reverberant building. The prominently placed screens to conform with the agreed customer requirements, designed to maximise the available space around the power packs by following the periphery of the platform kick-plates, and to be both aesthetically pleasing & harmonious with the parent structure / building, with no ‘line of sight’ through to the hydraulic power packs from floor level. Each Acoustic Screen to be the ‘walk-through’ type with ‘open’ sides & roof (avoiding the customer’s ‘confined space working’ policy that would require a 2nd man / lookout when carrying out daily maintenance and negating the need for ventilation, extra lighting & alarms etc. – thereby reducing costs whilst maintaining existing emergency escape routes and providing unhindered handling & maintenance access to the power pack) with personnel access / emergency exit doors to adjacent sections of platform and stairways. The Acoustic Screens (absorptive noise barriers) to be structurally sound, ‘tied back’ to the existing factory columns and manufactured in large modular sections to reduce site installation time at platform level. Wall lining panels supplied in ‘flat-pack’ form for site installation into retaining channels affixed to the existing (rear) factory wall, to reduce reflected & reverberant noise. The introduction of the acoustic screen & wall linings reduced airborne noise levels attributable to each hydraulic power pack from 84dBA at the platform edge to 67dBA when measured in a direct centre-line position to the power pack and at floor level within the noise shadow zone - well below the customer target noise level of 75dBA and the First Exposure Action Level (80dBA) of the Control of Noise At Work Regulations 2005. The bespoke three sided acoustic screen solution offered by Acoustic Applications has proven to be a great success in the new state-of-the-art aerospace production facility.